What-if books can go terribly wrong. They require a great deal of thought, generally because they are written about a time when a change in events would bring a massive change to history. In the novel Dominion, C.J. Sansom writes about Great Britain in the 1950s if it had not declared war on Germany but had held to Prime Minister Chamberlain’s desire for appeasement. The novel opens in 1952 as the people of Britain struggle between relief at keeping their “empire” and avoiding the inevitable death and destruction of another world war and a growing sense of unease about the Nazis’ actions in Europe and their unceasing desire to take over Russia. The Resistance, headed by an aging Churchill, continues its efforts to undermine the Nazis in Britain by enlisting civil servants to their cause. David Fitzgerald is one of these and when an old friend becomes a person of great interest to the Nazis (because of his knowledge about nuclear science) he is called upon to help get him out of the country and into the hands of American forces, where he’ll be safe. The problem? Frank Muncaster is currently being held in a mental facility after pushing his brother out a window. The Germans send one of their top Gestapo officers into Britain to kidnap Muncaster and it becomes a race to see who will get him first—and if he can survive. Dominion runs the risk of being sensationalist—focusing on Hitler and the Nazis and their insidious plans—but Sansom avoids this by writing to great effect of the personal details in this science fiction war. Fitzgerald is a spy but he also lives with his own secrets and great personal tragedy. His wife’s family is split between a sister and her husband who are all for the Germans and a father who, while not happy about the German involvement in Britain, still believes it is the best solution. Fitzgerald’s own father has left the country and moved to New Zealand rather than live under a Nazi regime. Even in such a troubled present Sansom elevates Dominion to a more literary level by writing of the inner battles of many of the main characters. Muncaster is blessed with a strong scientific mind but his unfortunate physicality has left him fragile and fearful. Fitzgerald’s wife, Sarah finds life after their tragedy hard to deal with and prefers to ignore what is happening around her. Dominion is a thriller, with the appeal of intrigue, danger, and deception, but so much more. World War II was a global war, the most widespread in history so a novel based on fundamental changes to the facts (appeasement, the assassination of Stalin in 1941) is fascinating reading for history buffs. Stopping is not an option because the outcome is now unknown. In this way, Sansom creates the internal tension of the individual’s values and ethics and the external tension of events. Who will win? This sounds really interesting! It’s got sort of the same premise as Jo Walton’s Still Life with Fascists trilogy, but it sounds like it goes in a very different direction. I admit I’m a sucker for a what-if book — I like a dystopianish setting best if it’s clear how the world got there from here. Hmmmm interesting! Will need to add this one to the TBR. I agree that what-if books are dangerous for some authors (probably why they are pretty rare). I think Stephen King’s 11/22/63 is an example of a GREAT what-if story. I guess what makes them a hard sell (for me at least) is that the author has to think about the potential “butterfly effect” that their historical changes will cause…every little thing that could be different because of this one change to history. Hard to do but it sounds like this author did a good job of it. Kelly, it was but nowhere near as complex as 11/22/63. That book was amazing. This is one what-if, the Brits let Hitler take Europe if he’ll stay out of England. It follows through from there. No hypothetical about the butterfly effect, follows through on the original premise. Still, a good read. Ooooooh this sounds really cool! I love a good what-if! Ooh, this sounds really interesting! It seems like the kind of book that could feel gimmicky, so I’m glad to hear it was done well! 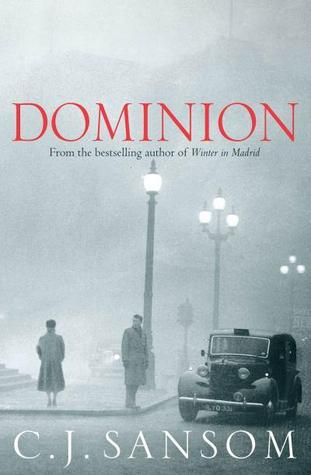 I’ve only read one book by CJ Samson and that is Winter in Madrid, which I enjoyed so much. Packed with history, but so good. I had someone recommend Dominion to me, because I wanted to read more by this author. I think that after reading your review, I definitely should. Thanks Catherine!